Learning centers in preschool can take a lot of time in planning, but not this Christmas writing center! It is quick and simple, but preschoolers love it because they feel like such big kids at this center! I fear that Christmas cards are becoming a thing of the past. Each year my family receives a few less cards, and more and more cards of those cards that we do receive are being replaced by E-cards, which I have to say are much less personal. Yes, they are funny, and they are a wonderful alternative for the busy family, but it’s just not the same as being surprised at the mailbox when you find it full of green and red envelopes, stuffed with glittery cards that drop with family pictures where everyone is wearing color-coordinated holiday attire. But I’m not guilt free here, either. I’ve also gotten out of the habit of sending out Christmas cards. I use my kids as an excuse. We have five kids now, ages seven and under. What used to be carefully drafted stories from the most recent year have turned into quick messages on Facebook and short well-meaning conversations in passing when we see friends out shopping. Because writing Christmas cards makes a wonderful Christmas writing center for preschoolers. You see, cards are always appreciated. Always. And let’s be completely honest here, who doesn’t love to be on the receiving end of a Christmas card when it comes from a sweet preschooler who is just learning to use symbols and drawings to convey words and meaning? During the holiday season when we are all so busy, I like fast and simple centers that still are “rich in learning.”We are all so busy this time of year as it is, why make things more complicated than they need to beI believe that a basic card writing center is just that. You probably already have what you need on hand, so it’s just a matter of pulling out the materials and modeling for the children what they can do at the center. At the writing center, set out a variety of writing tools and a stack of cards. The cards can be store bought from anywhere, maybe even a discount store, or they can be homemade. For this activity, I made some on my computer by putting together a Christmas clipart pieces so the children could color the cover of their card. (I got my clipart from Creative Clips). Alternatively, you could also offer the children blank greeting cards with some holiday stickers. The following are some of our favorite holiday stickers we use for a variety of activities throughout the season. I gave very few boundaries for this writing center. I didn’t want my preschoolers to feel like they had to write or draw something specific, but rather I wanted to allow them the freedom to choose the contents of their cards. Prior to introducing the writing center, we discussed some things that are traditionally included in a holiday card. I showed them a few examples of cards my family had received, and I was sure to teach them the parts of a card (much like a book). I wanted my preschoolers to understand that like books cards have covers and backs and the writing goes inside of the card. Most preschoolers started by coloring the front of their card. 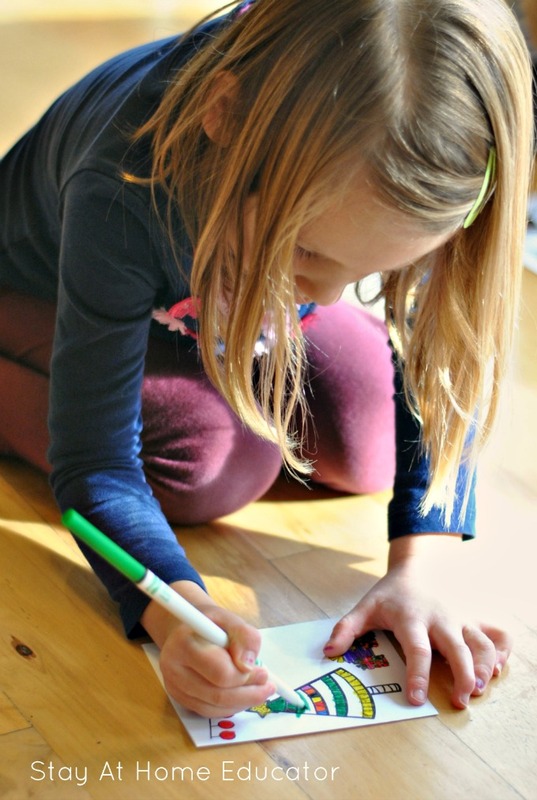 Again, you can also offer blank cards and the children can create their own covers, but unlike some preschool teachers, I find there is some value to coloring. You can see how carefully this preschooler is coloring in her picture, trying to stay inside the lines and using a wide variety of colors. She told me this card would be for her mother. Other preschoolers focused more attention on the inside contents of their cards. 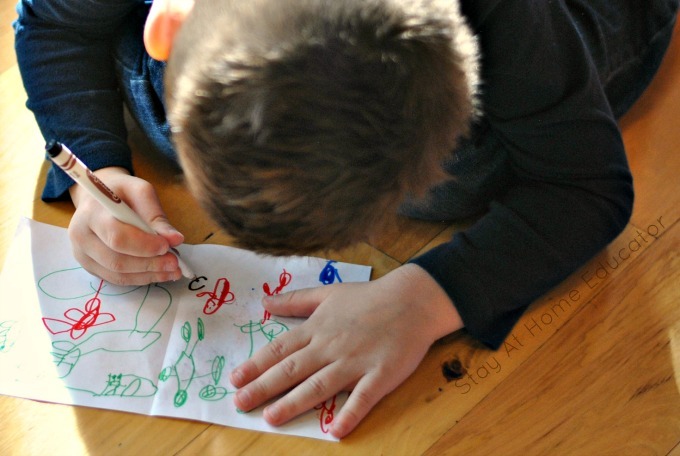 This preschooler drew pictures of his family members, including the pets. As he drew, he explained to his classmate the things he is looking forward to, like making a gingerbread house with his mom and going to his grandma’s cabin to go sledding. I like hearing a lot of talking while children are at the writing center. Since speaking and listening are two of the four domains of language, it only seems appropriate that a writing center be a little noisy with conversation. I gave the preschoolers the option to have me write a few dictated sentences in their cards or to let them be. Most of my preschoolers were so proud of their work that they opted to tell their parents themselves what thy had “written” in their cards. Some preschoolers scrawled symbols that represented letters to them, other asked me to write words on the whiteboard so they could try to copy them into their card. The point is, a good writing center will provide for children at multiple levels, which is why choice is so important for preschoolers. The preschoolers jumped up at the sight of their parents at arrival time and proudly handed over the cards tey had so carefully and thoughtfully made. And let me tell you, the parents loved every bit of those handmade Christmas cards, which only confirmed for me that this was a successful Christmas writing center. 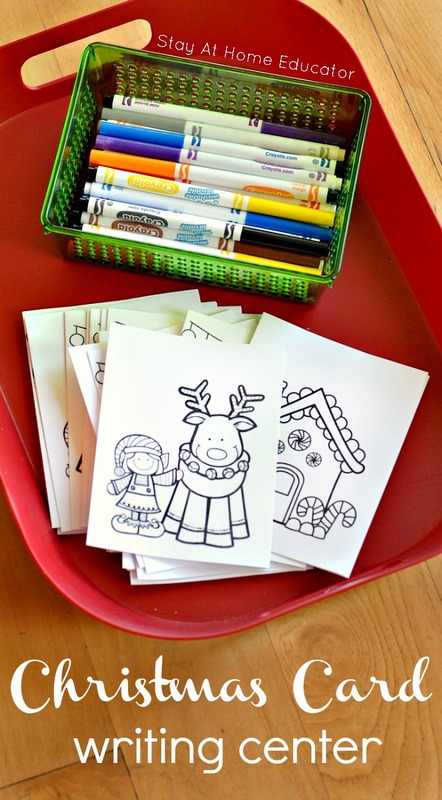 Looking for More Christmas Preschool Activities? 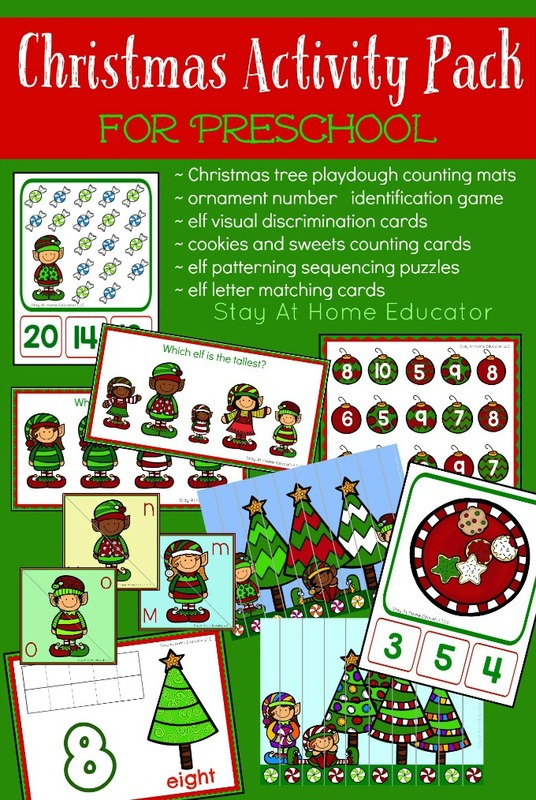 Have you tried out my Christmas Activity Pack for preschoolers? Or you can purchase it from my Teachers Pay Teachers Store.